Undecided on netbook or tablet? Can't decide whether or not you want a netbook or a tablet? Not sure if you want to switch to an unfamiliar Apple OS and app ecosystem with the iPad? Acer has your back, with its latest tablet-netbook hybrid, the Aspire Timeline 1825PT. The new Aspire Timeline 1825PT is an 11.6-inch netbook with a swivel-style screen that let's you convert it into a tablet-style device in a jiffy. (Not a bag. A short space of time). "A laptop, a photo frame, the perfect presentation tool and a notepad: the Acer Aspire 1825PT is all this and more," reads Acer's press release. "A wonder of technology and design, it combines the convenience of touch screen technology with the added bonus of all day computing. 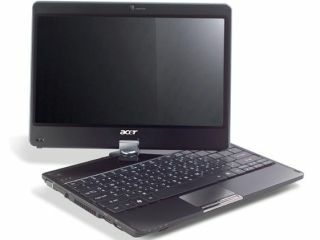 All this comes in an ultra-slim and light notebook with a 29 cm (11.6-inch) format that ensures extreme versatility." The new Aspire's swivel-screen multitouch panel features up to 1,366 x 768 resolution, and the machine packs in...(breathe in...) up to 8GB of DDR3 RAM, a 1.3GHz Intel Core 2 Duo SU7300 processor, integrated Intel GMA 4500MHD graphics, HDMI / VGA outputs, a 250GB or 320GB hard drive, an integrated media card slot, 802.11a/b/g/n WiFi, a VGA webcam, Bluetooth 2.1+EDR, gigabit Ethernet and a 6-cell battery to give you eight hours of work and play time with the thing. If you are lucky. Specs-wise then, it's at the very top end of the netbook market. Add in the bonus of a multitouch trackpad and the deal is almost sealed. Acer is even shipping these new Aspire's in a range of colours, including diamond black, sapphire blue and ruby red running a 64-bit copy of Windows 7 Home Premium.